Pod Bays are areas where the space pods can be docked. There are several pod bays on the station and one on the mining outpost. Main Hangar - A large bay designed for pod construction. Consequently, most of the equipment required to construct pods is found here, primarily the ship component fabricator and associated resources. Access is not restricted. Nanotrasen was generous enough to provide the station with a couple of unarmed light pods and miniputts. 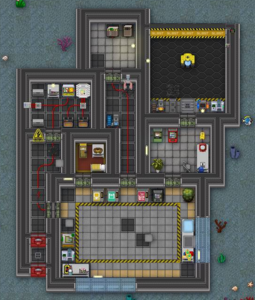 Security- A small bay with two heavy pods and a table with a couple of weapons arrays. 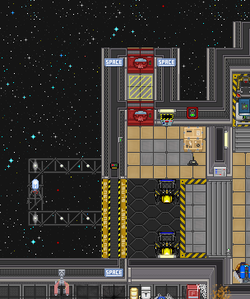 Cargo Bay - A large bay provided for the quartermasters. 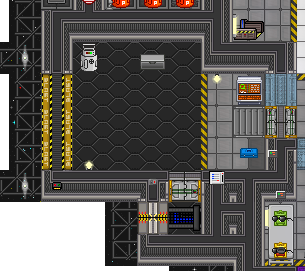 The cargo bay has its own side repair and storage room. Engineering - A small bay below the engine room. Contains two industrial miniputts. Catering - A small bay just north of catering. 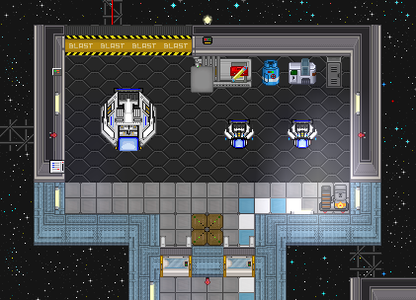 Contains a supply delivery dock as well as request console and some basic tools. Science - A small bay below the artlab. Contains a mechanical toolbox and a cargo router. Ostensibly intended for artifact delivery. 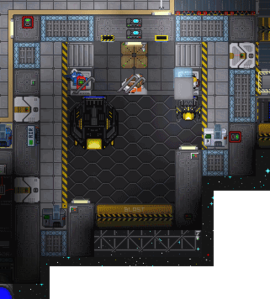 Mining Outpost - A small bay inside the asteroid where the mining outpost is located. 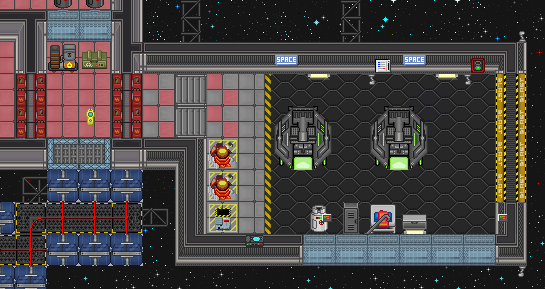 Contains a ship component fabricator, mining pods along with basic upgrades for them and welding supplies for repairs. Escape Arm - Two escape pods can be found here. 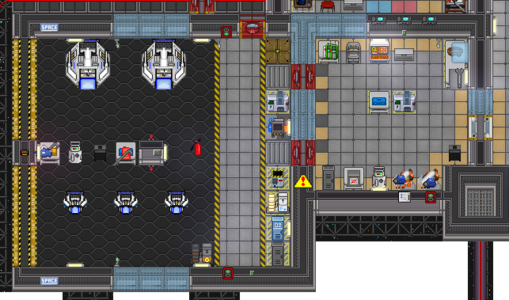 Due to the low number of escape pods versus the large crew count, they are in high demand when the time comes to evacuate. Market - Also known as the Main hangar. A large bay designed for pod construction. Consequently, most of the equipment required to construct pods is found here, primarily the two ship component fabricators and associated resources. Access is not restricted. Nanotrasen was generous enough to provide the station with a couple of unarmed light pods and miniputts. 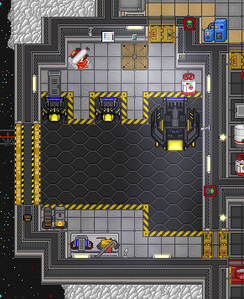 Cargo Bay - A large bay provided for the quartermasters and Miners. 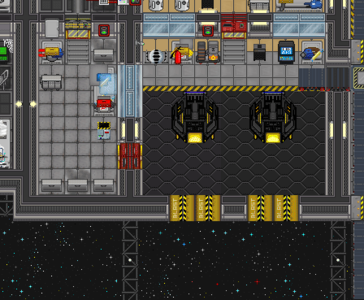 The cargo bay has its own ship component fabricator. 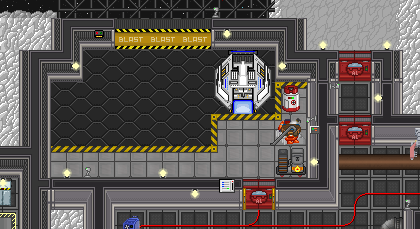 Comes with sturdy Mining Pods and various mining pod equipment. Engineering - A small bay above the engine room. Contains space suits, magnetic boots and internals. Comes with a an engineering pod for sealing hull breaches with construction foam. Catering - A small bay just north of tool storage. 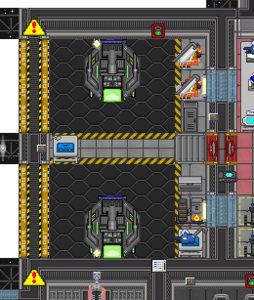 Contains a supply delivery dock as well as request console and some basic tools. Comes with a light cargo pod for deliveries. 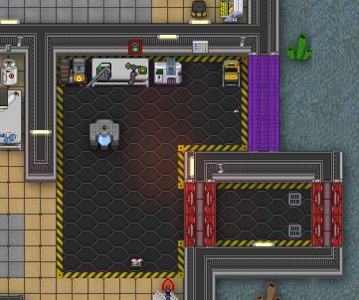 Science - A small bay connected to artlab. Contains a mechanical toolbox and some artifacts. Ostensibly intended for artifact delivery. There are several pod bays on the ship and one on the mining outpost. 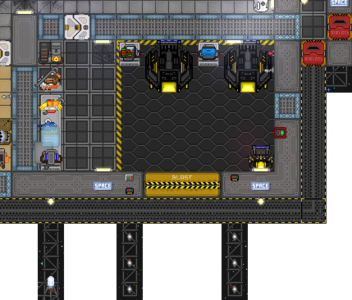 Civilian Pod Bay / Main Hangar - A large hangar designed for pod construction. Contains welding supplies, sheets of glass and metal, a general manufacturer, and ship component fabricator in the storeroom, and another general manufacturer and ship component fabricator in the actual hangar itself. Comes with two Escape pods as well as two miniputts and pods, which are locked. Crew members may randomly receive a code to one of these pods when the round starts or they join the round late. Security Pod Bay - Also known as Aft Pod Bay. 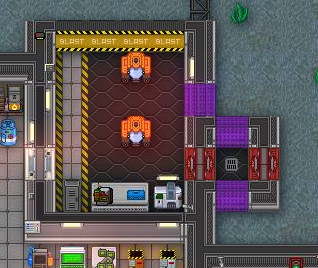 A small bay with heavy armor pods and a table containing a couple of pod tasers and tractor beams, along with various tools. Nearly identical to Cargo Pod Bay. 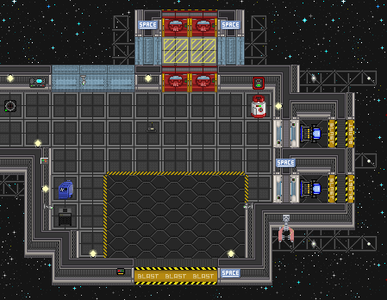 Cargo Bay - A small bay with industrial pods and various sheets of material and GPS units. Nearly identical to Security Pod Bay. Civilian Pod Bay / Main Hangar- A moderately-sized hangar, below Arrivals, designed for pod construction. Contains welding supplies, sheets of glass and metal, and a general manufacturer in the storeroom, and another general manufacturer, a cargo pad, emergency suits and hoods, and air tanks in the actual hangar itself. Comes with three miniputts and two big pods, which are all locked. Crew members may randomly receive a code to one of these pods when the round starts or they join the round late. 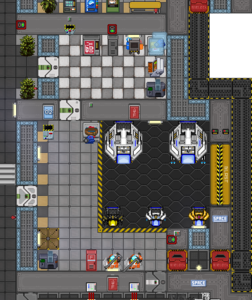 Security Pod Bay - An slightly larger hangar below Escape, exclusively for Security Officers and other Security personnel. 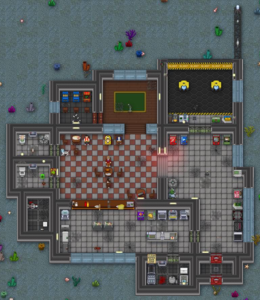 Contains heavy armor pods and a table containing a couple of pod tasers and tractor beams, along with various tools, a general manufacturer, and a ship component fabricator. 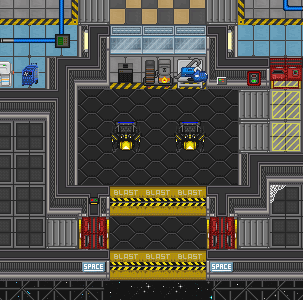 Cargo Bay - A small bay below the Cargo Bay with industrial pods and tables with mining pod equipment. Science - A small bay below the Artifact Lab. Features two unarmed miniputts with small cargo holds and a cargo pad. Ostensibly intended for artifact delivery. 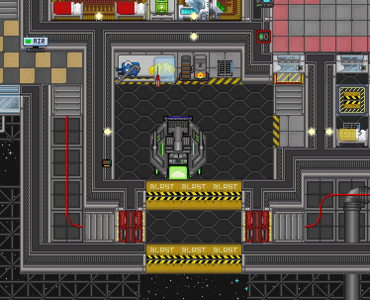 Civilian Pod Bay / Main Hangar- A rather large hangar, above the Arcade, designed for pod construction. 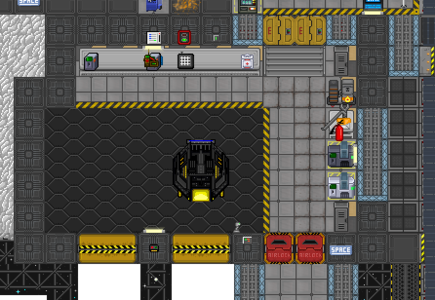 Contains welding supplies (for pod repairs), sheets of glass and metal, a ship component fabricator in the storeroom, emergency suits and hoods, and air tanks and another ship component fabricator and more welding supplies in the actual hangar itself. Comes with three miniputts and two big pods, all unlocked and ready to use. Aft Pod Bay - The second smallest of the on-station pod bays, located across the hall from Mechanics. Not much for the big pod here besides some welding supplies and a few spare cargo hold modules. There is a full emergency suit-hood-air tank set on a rack here though, which is nice. 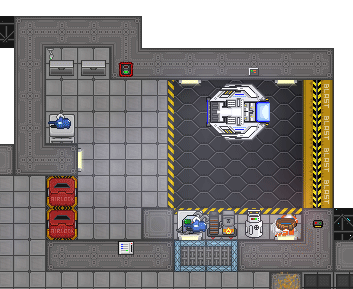 Cargo Pod Bay - A modestly-sized bay below the Cargo Bay with industrial pods and tables with mining pod equipment. 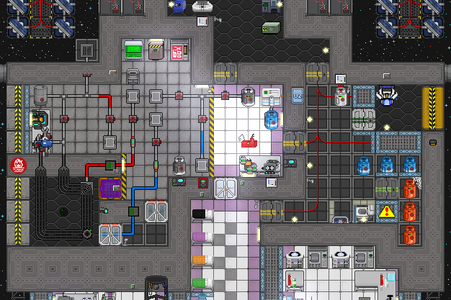 Engineering - A small bay northwest of the singularity. Contains space suits, internals, and magnetic boots, handy for safety walking around a operating singulo engine. Comes with a an engineering pod for sealing hull breaches with construction foam and escaping an malfunctioning singulo engine. Pod Bays are special places for Space Pods to dock. You can tell because of the pod-friendly reinforced floors and the big ol' hangar door. 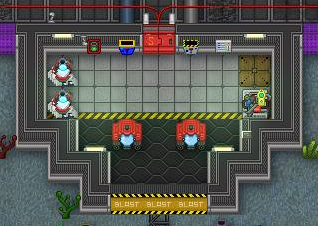 Since Mushroom Station comes from a time before Space Pods, the station itself has been retrofitted with only one Pod Bay, in addition to the off-station one at the Mining Outpost. 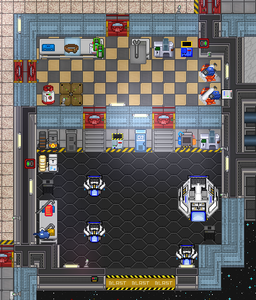 Civilian Pod Bay / Main Hangar- An average-size hangar, located in the Shuttle Bay at the very northern end of the ship, designed for pod repair and construction. Contains welding supplies (for pod repairs), cable coils, sheets of metal, a ship component fabricator. Comes with two miniputts and one big pod, all unlocked and ready to use. 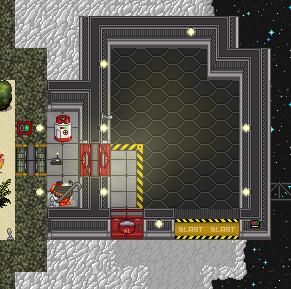 Mining Outpost - A small bay inside the asteroid where the mining outpost is located. Contains a ship component fabricator, mining pods along with basic mining pod upgrades for them and welding supplies for repairs. 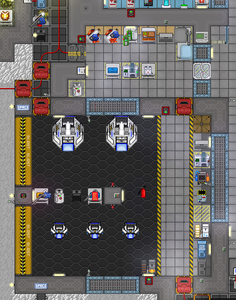 Pod Bay / Main Hangar - An compact yet spacious hangar, with just the right amount of space for docking, located above Emergency Storage B, in the northern parts of the donut. It's designed for pod repair and to some extent construction, so it contains welding supplies (for pod repairs), a toolbox of cable coils, a ship component fabricator. Comes with two miniputts and two big pods, all unlocked and ready to use. Secure/Security Podbay - A nice and spacious hangar, thanks to being a southern offshoot of the Security sector. 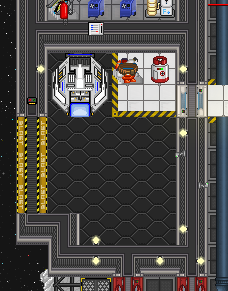 It contains emergency space suits and helmets, with accompanying oxygen tanks, plus a HoS-locked crate of pod lasers and some welding supplies for repairing the two big Sec pods that dock here. 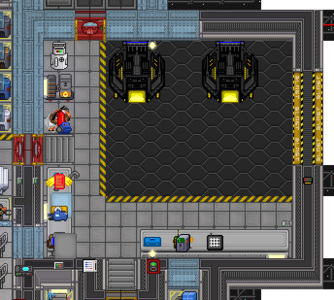 There's no wormhole beacon or hangar door computer, so if you want to dock, you better ask a fellow Security Officer. Pod Bay / Main Hangar - A wide and spacious hangar with plenty of room, both within and beyond the hangar door, located across from the Bar. Contains welding supplies (for pod repairs), cable coils, sheets of metal, a ship component fabricator. Comes with two miniputts and two big pods, all unlocked and ready to use. 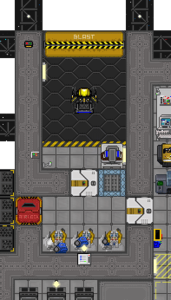 Cargo Pod Bay - A compact hangar that's just the right size for Cargo's durable industrial pod fleet. Contains one indiputt and one big indipod, plus the necessary welding supplies to repair them, an emergency space suit-helmet-air tank set, and an ever-coveted utility belt. 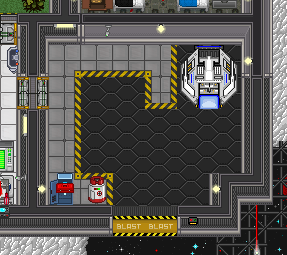 Science Pod Bay - A tiny, minimalist bay in the Research Vessel's Toxin Lab Storage that has juuuuuust enough room for the MiniPutt and its pilot to dock, exit, and unload cargo. This one doesn't have a beacon, so you'll have to wormhole to the beacon at Cargo then fly a little bit north and then a whole lot east. 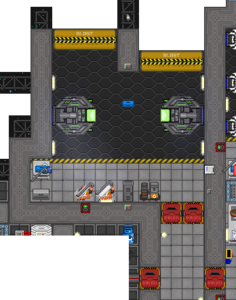 Mining Pod Bay - A nice and comfortably-sized hangar in the Mining Department, rather reminiscent of the one at the Mining Outpost. Contains some welding supplies, a highly-coveted first aid kit, and everything you need to outfit the big indipod and two indiputts for asteroid mining. Pod Bays are special places for Space Pods to dock. 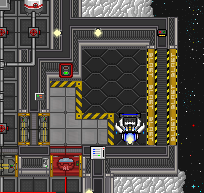 You can tell because of the pod-friendly reinforced floors and the big ol' hangar door. Since this resort is so large, Samedi's has plenty of them for ease of travel, with one for practically each department and then some. 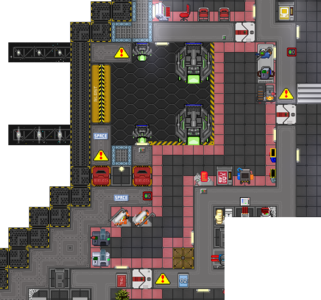 Arrivals Dock - A fashionably asymmetric hangar for latecomers, above the maintenance tunnel sandwiched between the Arrivals Checkpoint and Chapel#Samedi. Contains two miniputts and one big pod, plus a few pod phasers. 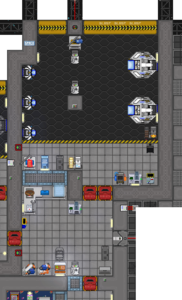 Medical Bay Dock - A rather large but sparse pod hangar, containing a emergency spacesuit set for one and a single big pod for Medbay's chronically understaffed team of doctors. 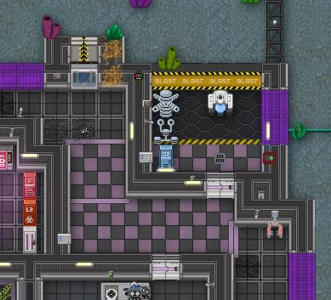 MedSci Dock - Another somewhat large but barebones dock east of pathlogy, with a single big pod for any geneticists or pathogen researchers trying to escape their experiments. 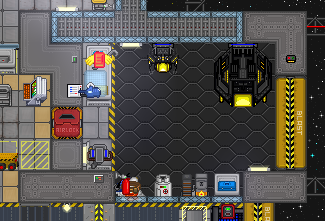 Command Dock - A small hangar near the Bridge that's just the right size for its glorious golden pod. 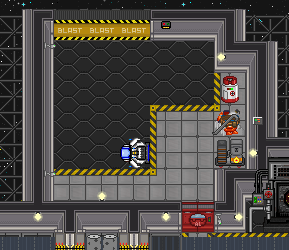 Catering Dock - A modestly-sized hangar for the Chef and Barman and the big pod they share. Shame they can't share the emergency spacesuit set though. Pod Bay / Main Hangar - The widest and most spacious of them all, and easily the most well-stocked, located a little bit south of the Bar. Contains welding supplies (for pod repairs), cable coils, sheets of metal, a ship component fabricator. Comes with three miniputts and one big pod, all unlocked and ready to use. 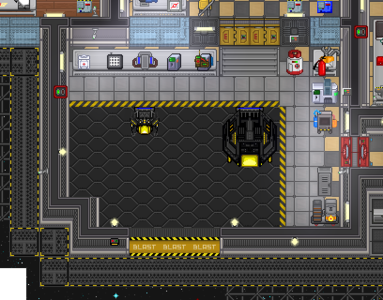 Cargo Dock - Cargo Bay's own special little hangar, just the right size for one standard miniput and one big indipod. Contains the necessary welding supplies to repair them, a set of pod phasers, an emergency space suit-helmet-air tank set, and an ever-coveted utility belt. Engineering Dock - A tall, wide bay on the west end of Engineering. 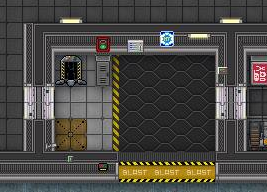 Contains two indiputts and one indipod (just enough room for the Engineers and the CE to escape in when the singularity goes awry), plus some Industrial Utility Arms for spraying construction foam into breaches from space. 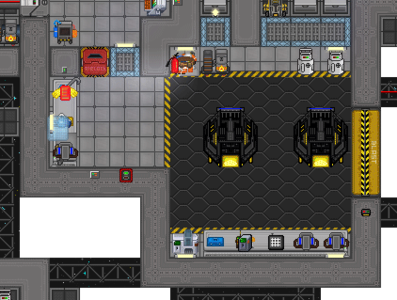 Mining Dock - A short but very wide hangar in the Mining Department's south end. Contains one indiputts and one indipod, plus all the attachments needed to outfit them for asteroid mining. Research Dock - Another short but wide bay, right above Artifact Research for easy delivery of artifacts. Comes one single big pod with ample cargo space, plus, curiously, a welding fuel tank but no welding tools. 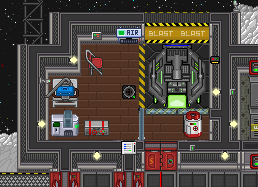 Research Auxiliary - An absolutely tiny dock on the east side of the southern asteroid, housing a single miniputt. Escape Dock - A medium size pod bay on the south arm of Escape. Contains no pods (except for the escape pods), but that's fine. Pre-existing pods would just get in the way of people trying to enter the escape shuttle from here. 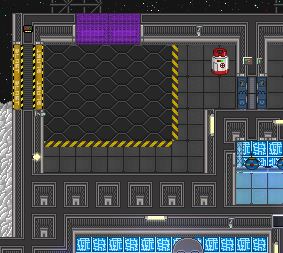 Waste Plant Dock - A slightly larger than average pod bay on the northern side of the Waste Plant. Contains a single miniputt, so the Clown get out of their hole without having to spacewalk. 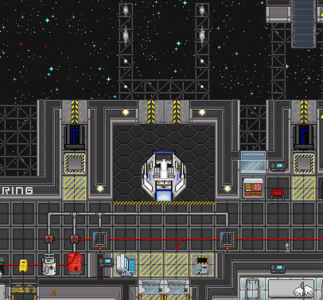 AI Platform Dock - Another medium size bay, this time on the AI Platform. It's empty, because it's not for the AI but the people who want to get into its Upload. Habitat Dome Dock - A small, dimly-lit bay, for receiving visitors into the Habitat Dome. Minisub Docks are special places dedicated the maintenance and storage of minisubs, each outfitted with reinforced hexagonal floors, drains, big ol' hangar doors, liquid energy-shields within said doors, and welding supplies in a crate or locker for minisub repair. They're basically the underwater equivalent of parking lots, with each one serving a different department. Pod Bay / Main Hangar - The biggest dock of them all, located just above the Public Market and Arrivals. 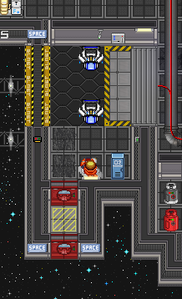 Comes with four standard yellow minisubs for all crew members, as well as a Ship Component Fabricator, some firefighting supplies, a few basic tools, and Cargo Hold modules. Secure Dock - A modestly-sized hangar south of the maintenance tunnel below Security. Contains a two Security Patrol minisubs, a few taser arrays, and two pairs of security diving suits. 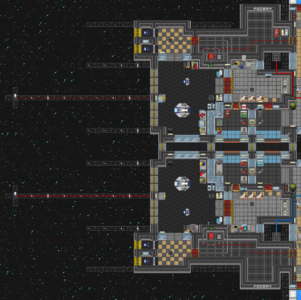 Mining Dock - A square bay that dominates Mining's northeast corner. 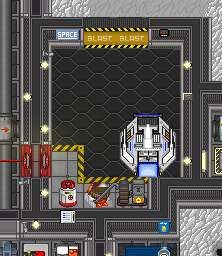 Contains a Ship Component Fabricator and two mining minisubs, plus the sensors and ore scoop system needed to outfit them for Trench exploration. 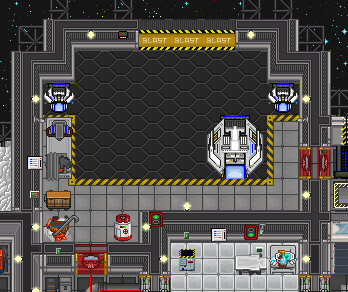 Catering Dock - A spacious but rather empty hangar for the Chef, the Barman, the four Botanists and the two civilian minisubs they all somehow share. 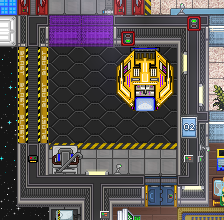 Research Dock - A rather compact dock, right above Artifact Research for easy delivery of artifacts and transportation to the Research Outpost. 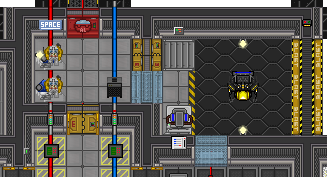 Comes one single civilian minisub, an emergency O2 closet, and a transport chute to the Research Outpost. 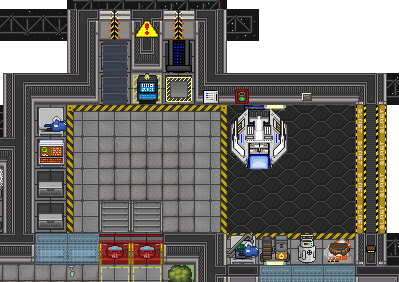 Research Outpost Hangar - A short but wiiide hangar for receiving incoming minisub visitors to the Research Outpost. 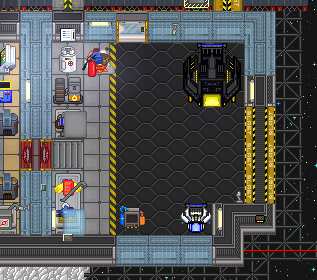 Engineering Dock - A small bay integrated into the general Engineering foyer, with a single engineering minisub. Contains a Ship Component Fabricator, some cargo hold systems, and a few Space GPS Units, so the Engineers don't get lost while setting up the geothermal capture engine. Tech Outpost - A rather large bay for the lone minisub stored here. Sea Diner - A large dock attached to the station's local underwater diner. Contains two yellow minisubs, Ship Component Fabricator and plenty of tools for any ocean-faring explorer who seek refuge here. Pod Bays are special areas of Atlas designated for the maintenance and storage of Space Pods, each outfitted with reinforced hexagonal floors, double airlocks into Space, and iconic yellow-and-black hangar doors. Though most are built on particular nations' territories, they are open to all countries, regardless of allegiance. 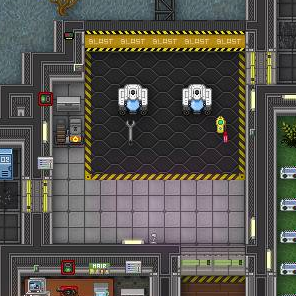 Research Dock - A tiny, minimalist bay on the left end of Researchica/Scientopia. 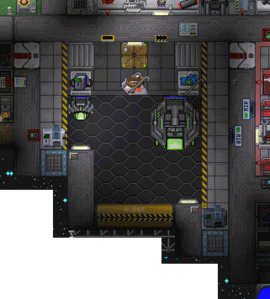 Its Scientists often use the two MiniPutts to find and deliver alien artifacts and other relics. 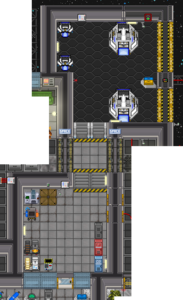 Uniquely contains a small alcove with an emergency space suit set and an emergency oxygen closet. 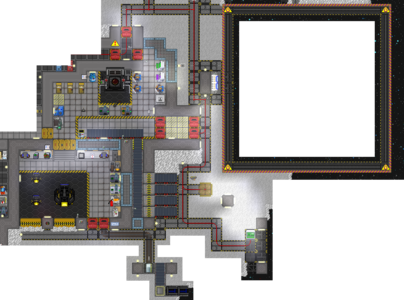 Mining Dock - A somewhat more comfortably-sized hangar built on Engiers's Mining Department province. 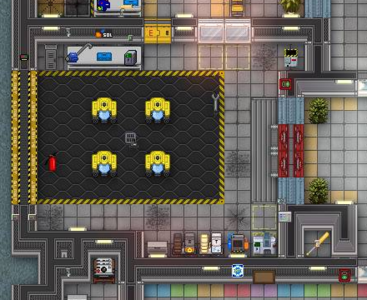 Miners often use the two IndiPutts to teleport to the Mining Outpost (since the shuttle to it is out of commission) and Mining Level and the unfortunately empty packing crate to store their finds. This page was last modified on 23 April 2019, at 22:59.